Volunteer alumna Emily basks in the summer sun at Salmon Lake. Are you called to serve an amazing part of our world? Western Alaska is waiting for you. Be transformed by serving a year as a KNOM volunteer fellow. Make a difference by providing companionship over the radio waves. Help move communities forward by reporting on breaking news. Live the mission by sharing in the incredible, millennia-old culture and lifestyle of the Alaskan Arctic. By choosing to serve, you’ll gain invaluable experience in live, on-air broadcasting. As a KNOM volunteer fellow, by the end of your year of service, you’ll depart with ample, practical work experience that can carry you into a career in radio or many other fields. You’ll also depart with money for school: whether for current student loans or future education needs. With the countless memories of a year in Nome, staff and alumni often say that they’ll be “unpacking the KNOM experience for the rest of their lives.” In Western Alaska, they’ll have positively affected others’ lives, too — through special connections with listeners, who often regard KNOM Radio as a local “friend and companion,” and through relationships developed in the local communities of Nome and the surrounding villages. 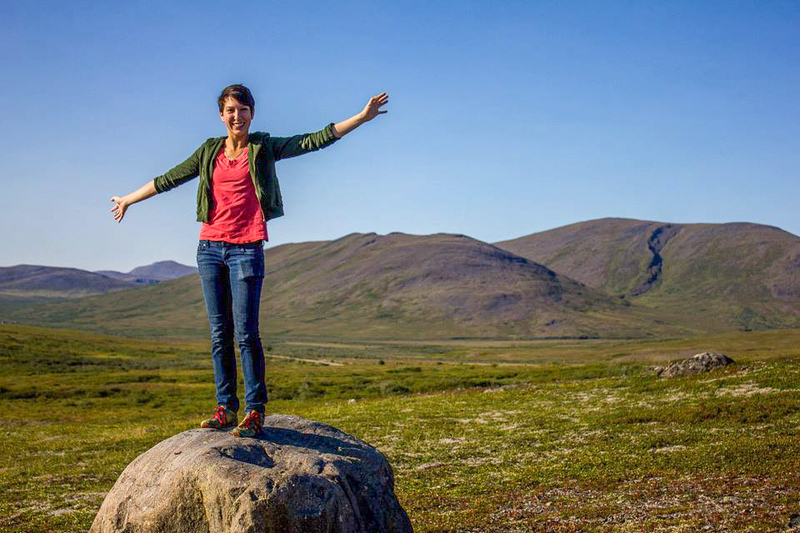 A year in Western Alaska means myriad opportunities to connect with youth and elders of the region, as well as rare insights into the traditional culture and heritage of Alaska Native tribes. Volunteer fellows at KNOM play an active role in our daily broadcasts – including our annual, in-depth coverage of the Iditarod Trail Sled Dog Race. 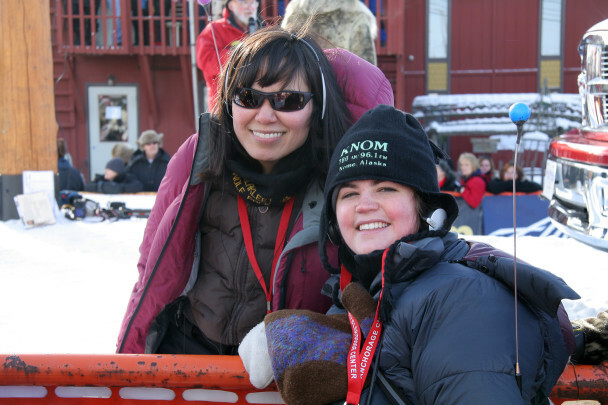 Pictured here are former news director Laureli Ivanoff and volunteer music director alumna Leah Radde at Nome’s Iditarod finish line. Since the very beginning of the station’s existence, KNOM volunteers have been at the heart of the mission. 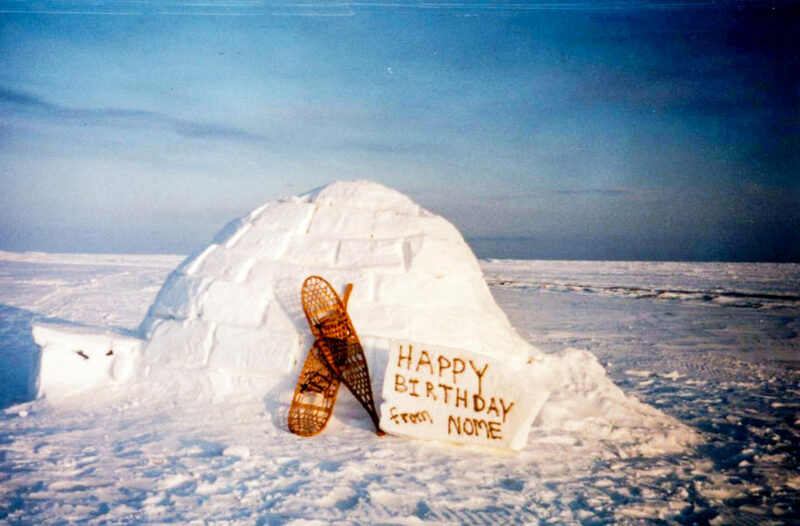 In the late 1960s, before the station even had its call letters “K-N-O-M,” some of the earliest volunteers in Nome used carefully-placed dynamite to cut through the sub-Arctic permafrost to lay the foundation for the station’s AM transmitter tower. They helped convert old, World-War-II-era military structures into the mission’s first dormitory and studios. For the five decades to come, volunteers have been essential to keeping KNOM on the air. 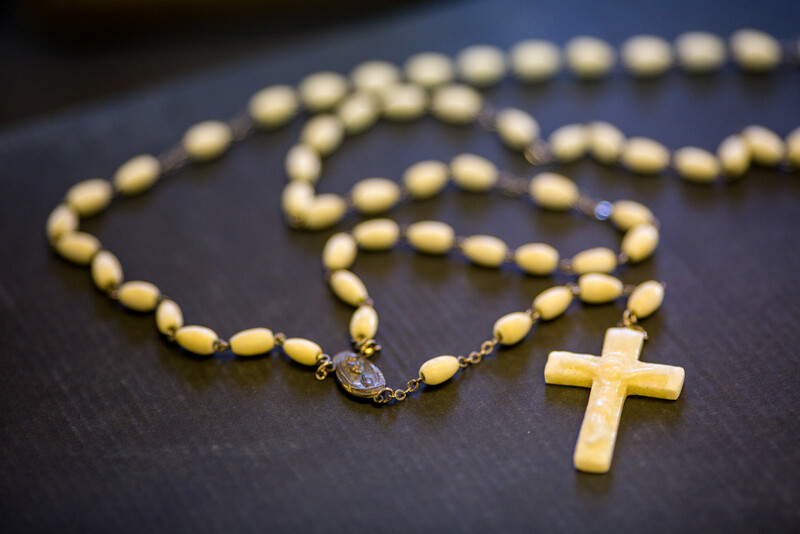 In years past, many of them came to the mission through partnerships with the Jesuit Volunteer Corps and other Catholic organizations. Even non-broadcasters had an important role: generations of local nurses and doctors saved lives during the day and sustained KNOM’s mission in their off-hours, by living and taking meals at the KNOM dorm and donating their salaries to the radio station. Today, volunteer fellows remain on the front lines of the station’s daily operations, although their specific job duties have evolved with the times (no dynamite handling is needed, and both the KNOM volunteer dormitory and the studios are modern, sturdy, and comfortable). KNOM’s volunteer fellows live out the mission of KNOM by “encountering Christ, embracing culture, empowering growth, and engaging the listener.” They serve the region through a blend of news and production duties at the station in Nome. Each volunteer fellow commits to a 54-week term, including two weeks of immersive training, typically starting in early June or July each year. KNOM volunteer fellowship alumni talk about their year in Nome as one of the most challenging and inspiring chapters of their lives — a time not only for service and professional growth but also for discernment, a reinvigoration of their faith or spirituality, and finding a fresh perspective on their place within the world. Thanks to the generosity of our donors, volunteer fellows are well supported during their service terms. In exchange for one full year of service, each fellow receives room and board, round-trip air transportation, health insurance, a monthly cash stipend, and, at the end of the service year, an educational fellowship award to cover past or future education expenses. All live together in a comfortable home near the studios. KNOM requires all volunteer fellows to have a bachelor’s degree from an accredited university before beginning their service year. Prior broadcasting experience is welcome but not necessary. Successful applicants are hard-working, self-motivated individuals who can think on their feet and whose actions demonstrate care and concern for others. We look for people who are dedicated, team-focused, flexible, and open to learning. Adult applicants of all ages are welcome to apply. Answer the call. Make it your mission. Share your gifts and talents: serve as a volunteer fellow for KNOM Radio. Find out how to apply, or read our Frequently-Asked Questions (FAQ) to learn more.